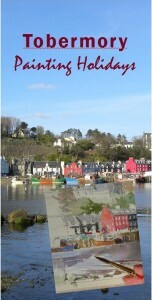 Tobermory Painting Holidays: Inspired by Tobermory’s waterfront. Individual tuition in a small group to learn/improve your sketching skills with an emphasis on enjoyment and achievement. Pencil and watercolour with a chance to try other media. Week-long and short courses, day-rate for those already staying on Mull.